I really haven't been in the crafting mood, other than crocheting. I think it was those long, cold, cloudy, dreary days of winter that got me down. But....now that it's spring-time and everything is blooming and turning green....my crafting spirit is back!!! .....well, I still adore it and she's now hanging on our back door....but wanted something a bit larger to go on the front door! 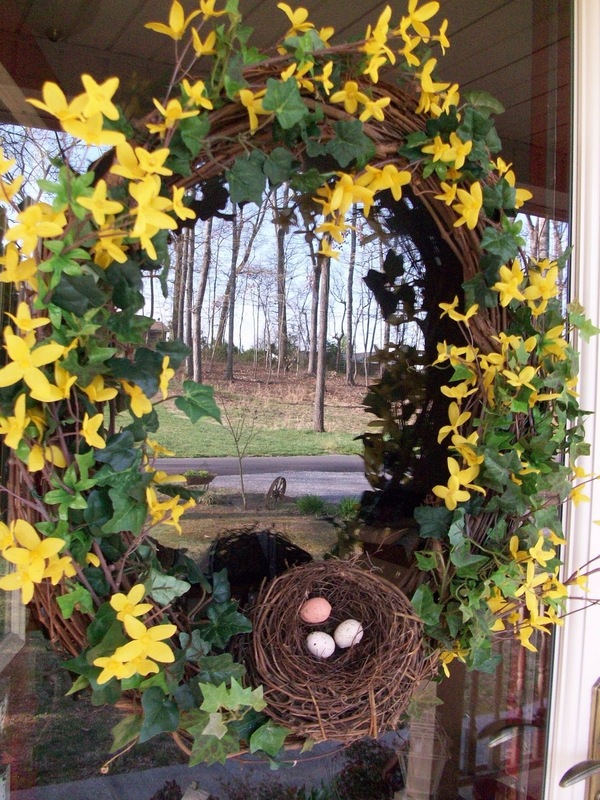 I've admired those big wreaths that are covered in forsythia blossoms....but refused to pay close to $30 for one. So....I came up with my own!!! 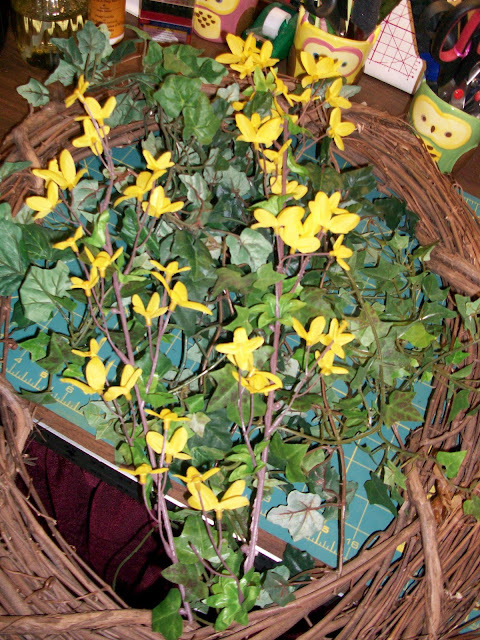 I gathered up a half-price grapevine wreath from Hobby Lobby and some forsythia blossoms that I found at Dollar Tree....went back for more and they were all gone, so somebody else must have had the same idea!!! A friend gave me bunches and bunches of ivy so that was free!!! 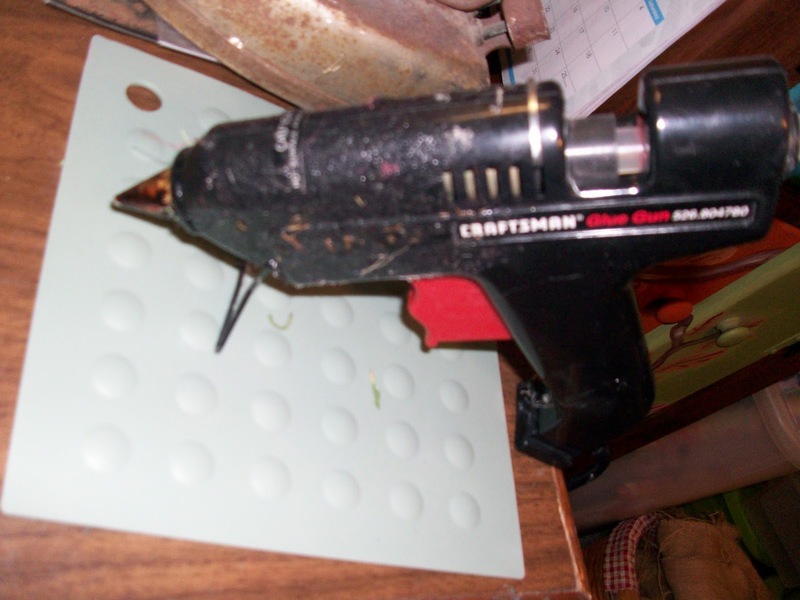 Gathered all my stuff together and heated up my trusty glue gun. Sorry the following pic is blurry, but I really wanted you to see what it's sitting on....a silicone potholder. You wouldn't believe how handy that is because the glue just beads up and falls right off if it drips....love it!!! I found the potholder at Big Lots! I glued and glued and wired and wired (used green Christ-mas ornament hangers for wire)....until I was satisfied with how it looked....found a birds nest that I've had for several years in my stash and also some eggs....and added them for a bit of extra oomph! You make lovely wreaths! 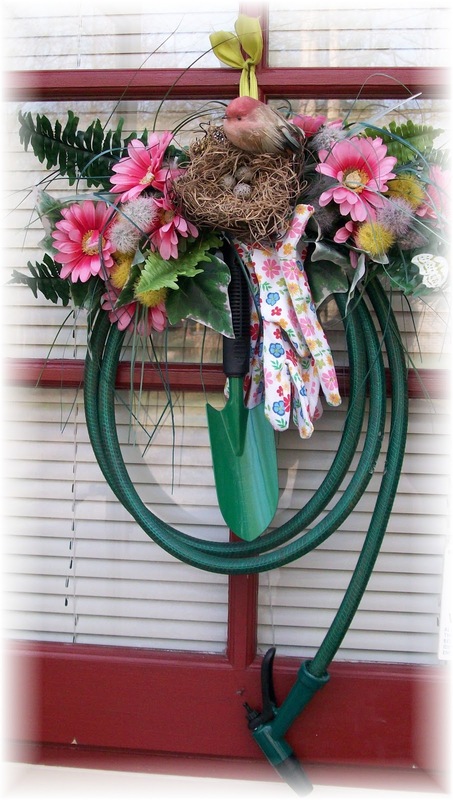 I think I like the garden hose wreath best because of all of our gardening. I just wanted to let you know that I have a linky up for Wednesday Words of Weightloss. I forgot it when the post went up a few hours ago. Have a great week! Beautiful! It is perfect for spring! I love that first one too with the gardening theme! Thanks for linking up!